The Höbers of the 20th century were secular intellectuals and professionals, and any religious affiliation they had was Protestant. A century before that, however, the roots of my father’s family were solidly Jewish. The transformation of the family’s identification between 1800 and 1900, from Jewish “outsiders” to socially integrated participants in civil society, was a fairly common story among educated Germans of the period. When I was growing up I was only dimly aware of these origins, but in recent years I have learned more. My first post in this historical series concerned my 5X great-grandfather, Jacob Hirsch, who lived in Karlsruhe in the late 18th century and later changed his name to Höber. Jacob Hirsch was a leader in that city’s Jewish community, and played a role in the early development of the city on behalf of the Margrave of Baden. I knew from my parents that Jacob was a merchant who had been appointed Hoffaktor, or Imperial Court Agent, to Franz II, Holy Roman Emperor and King of Austria, Hungary and Bohemia. This appointment was made official in Letters Patent, a large document in elegant calligraphy on parchment with the Emperor’s seal. A distant cousin had given this parchment to my mother in Germany only in 1939, after my father had already fled to America. My mother had to leave it behind when she too left later that year. The beautiful parchment was destroyed in a bombing raid on Düsseldorf in 1943. The only thing I knew about it was what my mother told us. Late last year, my friend Achim Bonte, a historian in Dresden, suggested that some record of this transaction might exist in Vienna, the seat of Emperor Franz II. Achim searched the online index of the Österreiches Staatsarchiv, the Austrian State Archives. Deep within the records of the Imperial Chancellery, under a subhead for titles and honors granted, Achim came up with a 1797 file with Jacob Hirsch’s name on it. It was hard to believe that something like this could have survived for 215 years, through all the European wars of the nineteenth and twentieth centuries, including the depredations of the Nazis. I was stunned when Achim sent me the link. 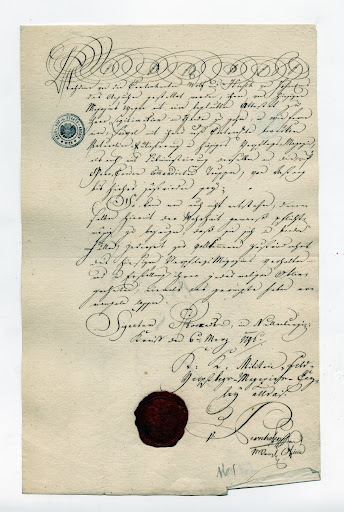 [In response] to your letter, the direction of the Haus-, Hof- und Staatsarchiv wishes to inform you that the granting of the title Hoffaktor to Jakob Hirsch in 1797 is preserved in our archival holdings “Imperial chancellery (Reichskanzlei)”. 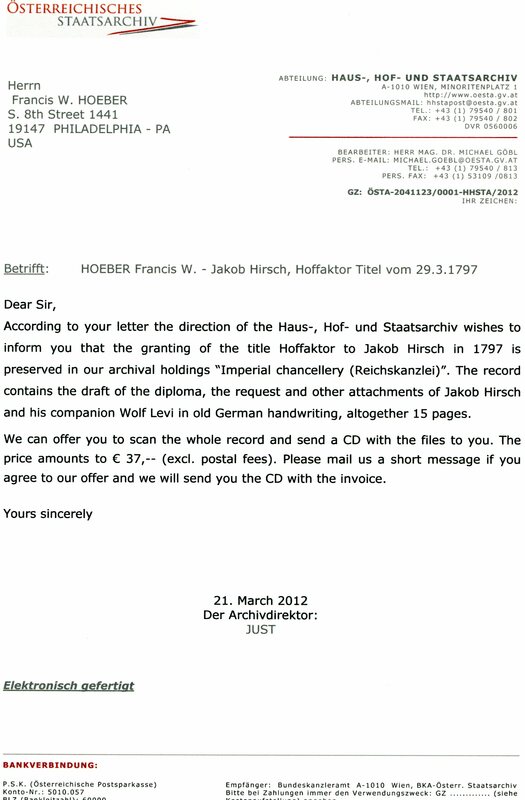 The record contains the draft of the diploma [i.e., the Letters Patent], the request and other attachments of Jakob Hirsch and his companion Wolf Levi in old German handwriting, altogether 15 pages. We can offer you to scan the whole record and send a CD with the files to you. The price amounts to € 37,– (excl. postal fees). Please mail us a short message if you agree to our offer and we will send you the CD with the invoice. This was an emotional moment. To have such documents, the real origins of my family, reappear after two centuries meant a great deal to me. I found it hard to believe it was true. I immediately emailed back to the Archives, asking them to send the scanned records as soon as possible. Within a couple of weeks a package arrived in the mail containing the CD. As soon as I slipped the disk into my computer I realized why they sent the files on a CD rather than by emailing them to me. Each scan is in excess of 45 megabytes in size, much larger than allowed by most email programs. This means that each high-resolution image is reproduced with wonderful clarity. Each page can be enlarged so that every stroke of the pen, each dot of ink, the varying textures of the different kinds of paper, are as clear as if I were holding the originals in my hand. They are stunningly beautiful. There was just one problem: I was unable to read more than a few words of each page. Although I read German, these documents were written in an old German script that has only a slight resemblance to modern handwriting. I have made only slight progress in learning this odd script, and was therefore frustrated in my attempts to read the documents I finally had in my hands. Fortunately, the last step in this process of discovery was surmounted by my cousin, Britta Fischer, who has mastered this tricky handwriting. I sent her copies of the images I had obtained and in a matter of a couple of weeks she succeeded in transcribing them into computer files, so that the wording of these historic papers was here in front of me. What I learned from the documents will be the subject of my next post.